Circles are of the toughest shapes for students to divide into equal fractions. Circles often get neglected as we teach students to break rectangles and squares into equal parts. Sometimes, just giving students a little extra practice and exposure to fractions of a circle can make a big difference in how comfortable they are working with circles. This is super important as they move on to learning about angles later on! One way to practice is by making are with circle fractions. (Like in Ed Emberley's Picture Pie book.) 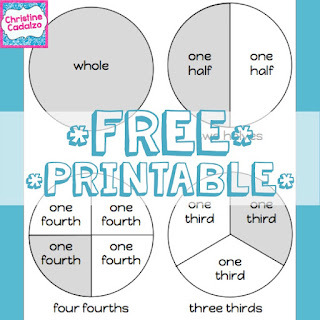 Click here for a FREE printable fractions of a circle template. Have the students cut out the pieces and use them to trace more fractions of a circle. There are also blank circles included, so students can practice drawing the lines or working with other denominators. Happy (Fractions of a Circle) Teaching! !